To add the calendar events to your phone so that you NEVER miss a KLP event again, click on the cross at the bottom right of the calendar. You’ll need to set up a google account, but when you do, you can sync it with the calendar on your phone. 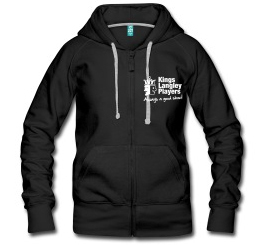 We have a t-shirt shop where you can buy KLP branded merchandise. It is mainly for KLP members – but if you are a super-fan, you are more than welcome to order something! Please note – no profits are made by the KLP or anyone else for the designs uploaded to this shop. Click on the hoodie below to access the shop. We pride ourselves in the KLP for being an inclusive society and encouraging our members to take part in ALL roles available to them, both onstage and behind the scenes. Other roles include Props, Prompt, Costumes, Set Design, Lighting & Sound Ops, Poster & Programme Design, Set Building, Painting and more. Try something new this year!